Last year my daughter-in-law decided to make her first quilt. We enjoyed finding the pattern out (Winning Hands), and she had fun at the quilt shop choosing her fabrics. 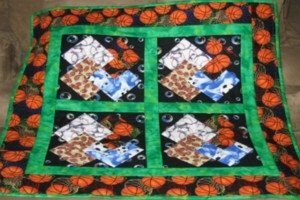 She married into a basketball family so she knew she wanted the basketball fabric to be the main print. 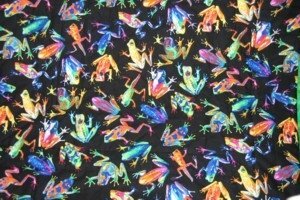 We all love the backing fabric...wildly colorful frogs. Last week she & I sandwiched and prepared the quilt for machine quilting. I spent that evening quilting it and then stayed up til almost 3 AM finishing the binding off. I was so excited to hand her her finished quilt the next morning. 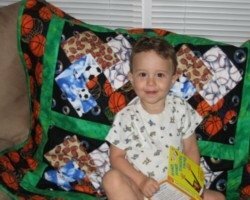 She had a lot of fun with her first quilting project, and she LOVES her finished product (so does the little man).